This simple and flavorful fresh tomato pasta sauce with basil, capers, and olives lets you escape to the Italian countryside for an end of tomato season celebration (recipe here). Autumn already? Yes, please. The leaves have started to turn here in Missouri, and the oppressive heat and energy-sucking humidity of summer are history (I think). But just because we've already had a few nights down in the low 40s doesn't mean I'm giving up on the heirloom tomatoes and basil in my kitchen garden just yet. My four sprawling gold nugget cherry tomato plants, which were loaded with sweet little fruits and planted first so I would get ripe tomatoes as soon as possible, were finished weeks ago; I highly recommend this cheerful variety. And the usually prolific and flavorful San Marzanos are just about done after battling some kind of wilt all summer and offering up a small and lackluster harvest. It may have been the new (to me) strain of this classic paste heirloom that I tried, or maybe it was just the weather. You never know around here. We haven't been eating them all, so I've been drying a bunch for winter. But the tasty and reliable VFN slicers (a disease resistant variety I bought from a tiny co-op back in 1995, my first year gardening in Missouri, and have been saving seeds from ever since) and the pink Arkansas Travelers, a pretty, longtime favorite with great flavor that tolerates heat and humidity really well, are finally just coming into their prime. No problem. A few bed sheets draped over the plants on those cool nights and we're still good to go. After tomorrow night, it's supposed to be in the 80s during the day and stay up in the 50s for at least the next ten days, so I'm looking forward to a little more vine-ripened bounty before I bring all the green tomatoes indoors to ripen. This easy No-Cook Fresh Tomato Pasta Sauce is my version of the simple, flavorful pasta sauce made with chopped raw tomatoes and uncooked seasonings that is eaten in country houses all over Italy, and it's the perfect way to celebrate the last juicy tomatoes of the season. Capers, kalamata olives, garlic, and fresh oregano and basil amp up the Mediterranean flavors, while tossing the hot, drained pasta with some of the tomato sauce juice is a neat trick that makes the whole dish taste lustier. A hunk of crusty bread to sop up every last drop of sauce is optional. Enjoy! So how did your tomatoes do this year? Any spectacular successes? Massive failures? Tips, tricks, brilliant discoveries? New favorite varieties from the garden or the farmers market? P.S. Greek Style Panzanella Salad with pan-fried croutons (I love this stuff) and my extremely popular Super Simple, No Sugar, Salsa-Like Green Tomato Relish. 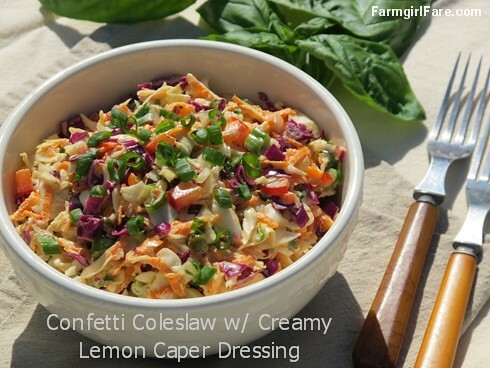 © FarmgirlFare.com, always garden fresh. Wow, it's hot out there. Two weeks in the 90s, blazing sun, and not a drop of rain. I think today it's supposed to hit 99 degrees (Joe won't let me look at the forecast) and stay there into next week. Despite twice daily watering, pretty much everything in my kitchen garden is looking haggard and unhappy. I'm drenched in sweat, and the fields are crunchy and parched. How can it be so dry and humid at the same time? The sheep spend their days camped out in the shade, and the chickens are laying around panting. This may just be a typical late August in Missouri, but I can't help dreaming of cool breezes and a nice big thunderstorm. I'm sure they'll be here one of these days. In the meantime, a chilled glass of this easy homemade vegetable tomato juice is a refreshing way to drink your garden veggies and keep up your stamina while working out in the heat. This flavorful, rejuvenating juice is like Campbell's V8 juice but much better, and it's been one of the most popular recipes on Farmgirl Fare since I originally posted it back in 2008. 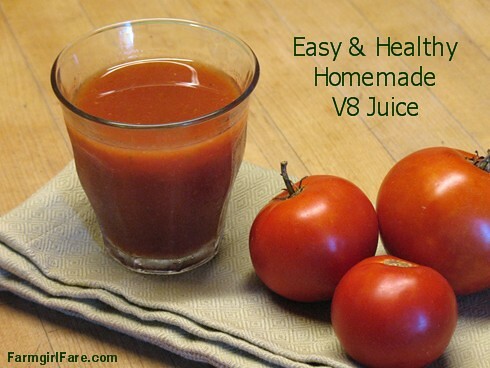 Did you know V8 juice is mostly made from water and tomato paste, plus a frightening amount of salt? To make it, all you do is chop everything up and toss it into a pot, simmer until soupy, then put it through a food mill. It's a great way to use up overripe, imperfect, or just plain ugly tomatoes, which you can sometimes find for a deal at farmers' markets—or languishing in your own garden. 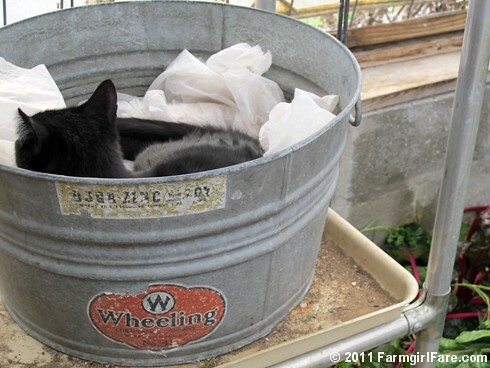 © FarmgirlFare.com, home of the dusty donkeys. 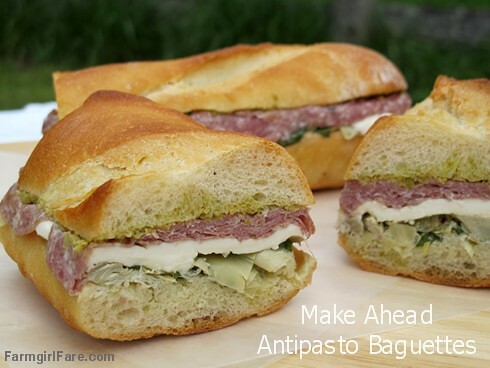 These scrumptious sandwiches, piled high with salami, mozzarella, marinated artichoke hearts, and an easy homemade green olivada, combine the flavors of an Italian antipasto platter in a handy, portable form (recipe here). The only thing better than a big homemade sandwich? One that actually improves in flavor if allowed to sit for a while. Convenient and better tasting? That's my kind of food. These Antipasto Baguette Sandwiches taste best when prepared the day before serving, making them perfect for toting on picnics, hikes, and road trips, or even packing in school and work lunches. Or just enjoy the simple pleasure of knowing that a delicious feast is waiting for you in the fridge. If you're serving a crowd, you can use a 16- to 20-ounce loaf of rustic bread and double the ingredients to make one giant sandwich; serve on a cutting board with a big serrated knife. Offer a bowl of colorful cherry tomatoes on the side, or make a quick salad by tossing chopped garden fresh tomatoes and cucumbers with some of the homemade green olive paste or a simple vinaigrette. P.S. Lemony Tuna and Artichoke Cooler-Pressed Sandwiches and easy homemade Four Hour Parisian Daily Baguettes (a great recipe for beginning bread bakers). © FarmgirlFare.com, listening to the lovely sound of thunder rumbling and rain falling on the first day of July and getting ready to cut another batch of hay on the second. And also thinking that the two half-gallon jars of fresh mint sun tea sitting outside (in the rain) probably aren't ready just yet. Friday Dose of Cute: Have a Tri-Colored Weekend. 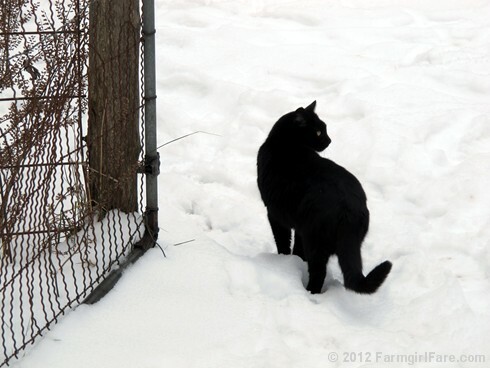 Henry says it smells like spring. Hi! What have you been up to? We've been busy tackling lots of little outdoor projects, digging in the kitchen garden, mowing grass (already! ), playing catch-up after several weeks of both being down with the flu, getting the sheep sheared and the lambs sold, baking lots of sourdough French bread, mourning the death of my camera, enjoying the biggest and brightest daffodil display we've had in years, trying to figure out why I haven't been able to access Blogger (and create blog posts) on my computer in months, snuggling sheep and petting donkeys, picking gorgeous salad greens every night, getting to know our wonderful new (old) beagle, Henry, who is our sixth (!) dog, creating an enclosed outdoor play area for George and Skittles, the two cats that live in The Shack who I don't think you've ever actually met, buying manuals and tracking down all the parts so we can rebuild the engine on our little old diesel tractor that's been out of commission for over a year (because we can't find anyone to fix it for us), watching the deer and wild turkeys out in the hayfield, listening to what sounds like thousands of tiny birds chirping in the trees, eating homemade yellow cupcakes with chocolate buttercream frosting, building a new cedar potting bench (because my old one collapsed several years ago), hunting for useful treasures at the junk store, admiring the hillsides full of blooming dogwoods, plotting and planning, dreaming and scheming . . . It's already been quite a spring! © FarmgirlFare.com, the flowering foodie farm blog where the days keep getting longer and dinnertime keeps getting later and later. It's the busiest time of the year!